A great way to pack in your daily dose of veggies is to add some fruit to the mix which can typically mask most vegetables that have a stronger taste. I like to have about 75% of my juice recipes be vegetables to keep my sugar levels down and also to pack in the nutrients I often miss in my diet from leafy greens and darker veggies. When it comes to fruits. I typically include in my recipes a fairly short list. I like using apples to add sweetness and you can get quite a bit of juice from them compared to other fruits like blueberries, raspberries, etc. Apples are also fairly inexpensive which is helpful in keeping your juicing habit from breaking your bank. 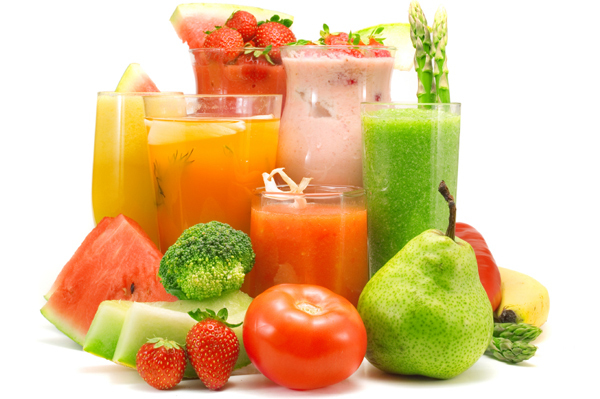 I also like to use watermelon, pears, oranges, and lemons which also happen to be high yield juicing fruits. When it come to vegetables I don’t care quite as much about the juice yield, I’m more focused on the nutrients I’m trying to get from vegetables. However, there are quite a few nutrient dense high yield veggie options. Cucumbers are a great high yield veggie that I add to most recipes. I will sometimes peel the cucumbers ahead of time to avoid the skin mucking up my juicer too much. You don’t get much juice from the skins anyway. Carrots and beets are also great high yield vegetables that add a masking sweetness to most fruit and vegetable juice recipes. Tomatoes are a good option as well, but perhaps I should have included that in my fruit category… the debate lives on! Some of the harder to juice, but nutrient dense options I like to use are spinach, kale, parsley, and basically any other vegetable I might have in my fridge that I was not quite looking forward to eating on its own. You pretty much can’t go wrong with most recipes if you have as your base apple, cucumber and carrot for the majority of your recipe to mask whatever other veggies you might not enjoy to juice on their own.